So what I’m interested in, the very key, the very essential, the very key thing, the most important thing is, somebody attaining this path: the three principal aspects of path to enlightenment, with the root of the path, guru devotion. I think that’s just amazing. That is the inner, the real development of Dharma organization. 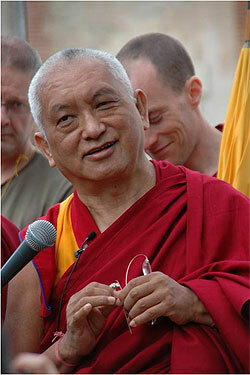 Colophon: Lama Zopa Rinpoche at CPMT, Long Life initiation, May 2, 2009. Transcribed by Ven. Munsel for LYWA. Lightly edited by Doris Low for FPMT News June 2009. Discovering Buddhism has gone online! In April, FPMT’s Online Learning Center was launched with second and twelfth modules, “How to Meditate” and “Wisdom of Emptiness.” In June, the first and tenth modules, “Mind and Its Potential” and “How to Develop Bodhichitta” will go online followed by the remaining ten modules over the next six months. To follow the program online or learn more about what’s in store for the Online Learning Center visit Foundation Membership (soon to be renamed Friends of FPMT). Light of the Path: The first-class multimedia team responsible for video recording and webcasting the Mani retreat in France has agreed to do their magic at Light of the Path in September, North Carolina, USA. For all those who cannot attend, the teachings will be webcast with English transcription. For those who will attend, you can also look forward to first-class video, audio and simultaneous transcription. Space is limited, so register now if you haven’t already done so. Although there were some last few changes suggested at the Mani retreat, there was much rejoicing in France for the comprehensive Retreat Prayer Book provided in English, French and Spanish. All the changes and corrections suggested will be incorporated in time for Light of the Path where the prayer book will also be made available in Chinese. Many productive meetings took place post-CPMT with our new English translation coordinator, Ven. Joan Nicell, members of FPMT’s English translation team as well as many involved in translation into other languages. It was concluded that the first major task for the English Translation Office is to create a database of Tibetan terms, the various existing translations and the standard FPMT translation with explanations for why a particular term is chosen. The hope is to include multiple languages in the database. In this way, a comprehensive record will be established that outlines FPMT’s glossary of terms – a totally necessary and totally mind-boggling project! 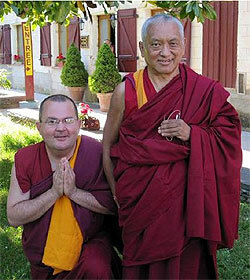 Hot on the heels of the CPMT came the Mani retreat led by Rinpoche and assisted by Ven. Dondrup. Besides the 200-400 people attending on site, many signed up for the at-home retreat. Our heartfelt thanks and congratulations go especially to the host, Institut Vajra Yogini, and their helpers for their generosity and faultless hospitality. 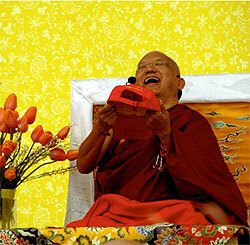 Their webcast of Rinpoche’s teachings also received a lot of warm appreciation. “The CPMT meeting was very, very successful, very enjoyable, very happy, a very encouraging meeting, which has shown many results during the talks. It’s not only explaining, but it’s a lot of success. That really shows great hope, really great success in the near future, many practices to liberate so many sentient beings in this world from various problems and various sufferings, for peace and happiness, the body and mind, then especially benefit the individual person, and benefit the world. “Not only do we offer social service, which brings so much happiness and joy to the world and individual sentient beings, but most important, we have so many Dharma centers which have the Basic Program. Ever since the centers started, there have been always so much teachings, meditation, retreats, and practices for bringing the mind of the sentient beings closer to liberation and enlightenment and more distant from samsara and the lower realms. So this has happened already, many years ago, and now we have the Basic Program in many centers, and then the Seven Year Program [i.e. the Masters Program, currently of 5-year duration]. I’m wishing to start the Masters Program also in the centers. Geshe Jamphel is very inspired to start the Seven Year Program at Nalanda – it’s very encouraging, so I think the other centers could also start that. “So where it comes to learning Dharma and philosophy, which helps to achieve [the path to enlightenment], there is no shortage – amazing! That one is like the sun shining, the organization gives Dharma like the sun shining, making sentient beings wake up or awaken, so it’s really most fantastic. “I think along with this we already we have several retreat places. However, we need to organize the retreat better, have people meditate on the path with guidance. Having experienced teachers guide [students] on the path to enlightenment – that needs more organization. Besides people doing preliminaries and deity retreats, like the inner scientist, meditating on the lam-rim, having those realizations – this is what we need. So, yes, you can practice tantra, but you need bodhichitta before that, you need to realize emptiness, and especially bodhichitta. Then, for that you need renunciation as a foundation, and for that you need the root of the path to enlightenment, guru devotion. Wherever you are, there’s need to organize well at the retreat place – to guide the meditation, that’s what really I think is the most important thing. The most important is to guide the practice so that when there’re obstacles, there are those who can eliminate obstacles, who can advise what to do and guide. “Even if there’s no meditator who has achieved the clear light and illusory body like Lama Yeshe, it’s to have like those great scholars and meditators who, while they are in the monastery, debating, teaching others, or themselves learning, while having a very busy life, have realization of bodhichitta and emptiness. I’m not saying we don’t have such persons – of course, I cannot see who has clear light, illusory body or unification, but what I’m looking for is the realization – persons who have realization of renunciation of samsara (renunciation of this life, renunciation of future lives) and bodhichitta realization, the root of the path to enlightenment, guru devotion realization, so, this. If the people studying Dharma or doing retreat are able to have lam-rim realization, the path, then no doubt, it’s much easier for them to achieve tantric realizations. “So what I’m interested in, the very key, the very essential, the very key thing, the most important thing is, somebody attaining this path: the three principal aspects of path to enlightenment, with the root of the path, guru devotion. I think that’s just amazing. That is the inner, the real development of Dharma organization. In case you have not noticed, advice from Rinpoche, meeting notes, Power Point presentations and photos from CPMT 2009 are now in the FPMT Affiliates Area! The new study group in Indonesia has decided on the name, “Lama Serlingpa Bodhichitta” from among four others suggested by Rinpoche. 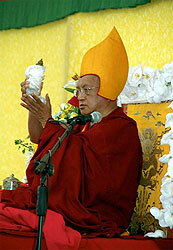 Atisha received teachings on bodhichitta at the feet of Lama Serlingpa Dharmakirti. Indeed, Rinpoche has recently given his blessings to Ven. Jinpa to start a study group, named after the Indian pandit, Dignaga, in the Polish capital of Warsaw. First ordained in the Theravada tradition in 1993, Ven. Jinpa (pre-ordination name: Zbigniew Modrzejewski) met Lama Zopa Rinpoche at the November course in 2000, and took novice vows in the Gelug tradition the same year. The Polish-Canadian has worked for Maitreya Project in Kathmandu, lived at Thubten Shedrup Ling and Nalanda monasteries and helped to develop the websites for Root Institute and Kopan’s Maya Daya Clinic. As such, Ven. Jinpa is not new to the FPMT. Nonetheless, he has chosen Jamyang London to be the guiding center for Lopon Chok LangStudy Group, underlining the importance of having the more established centers and experienced directors lend a helping hand as the FPMT enhances its global presence. 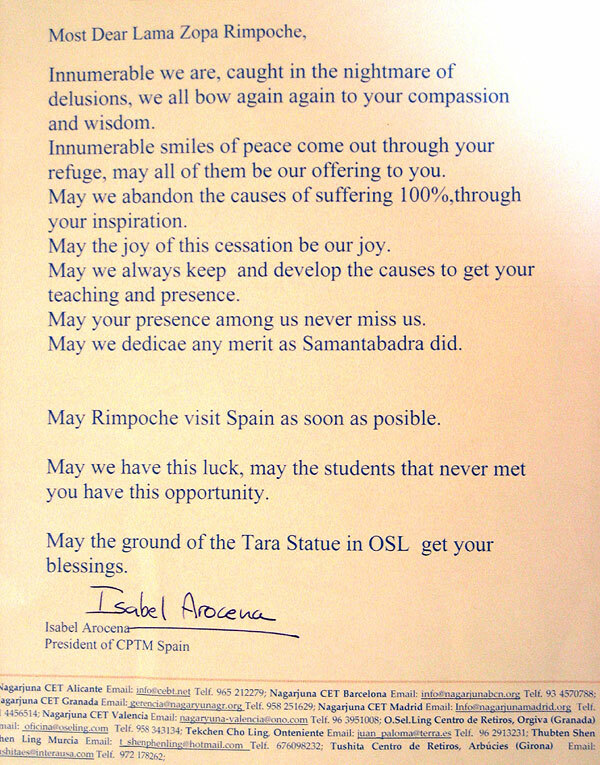 Rinpoche is making a quick stopover in Madrid after the Mani retreat – and we can count on Isabel’s letter having been part of the many causes and conditions that made the visit possible! Ian Green was thrilled to announce that the Jade Buddha tour of Vietnam had attracted some 4 million visitors by the time it drew to an end. The Tour is booked out for the next two years, and will next enchant and bless the people of Australia and America. Opportunities include media and technology “guru” at Vajrapani Institute, USA; spiritual program coordinator at Chenrezig Institute, Australia; and volunteer positions at Nalanada Monastery, France.